When you came home at first. But then my bubble burst! you peed upon my floor. You pooped right by the door. you were the first dog of mine. to stay, sit, and down. That’ll do and spin around. and to not take life to seriously. what joy looks like each day. I learned loyalty that way. Do dogs really go to heaven? we certainly know they’re there. I plan to see you again. With your tail waggin’ and a big ol’ grin. 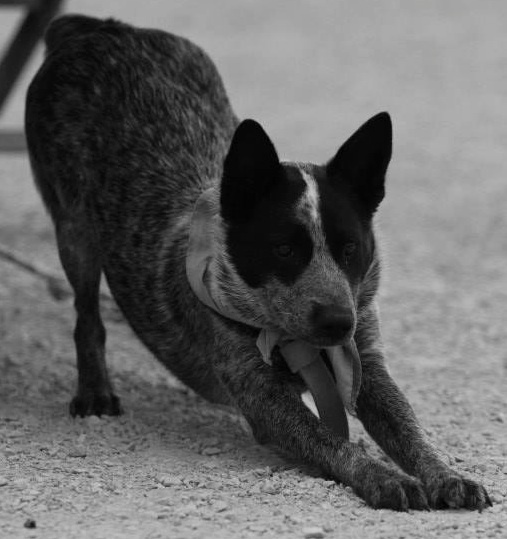 Most of you know Penny, my two year old blue heeler. She has been a teacher, a confidant, and friend to me since I brought her home. She teaches me more about myself than any other thing on the face of the earth. My insecurities are brought out when Im with her. My faults are on display when we are training or working together. What you probably didn’t know is the reason we got her was because of another dog. 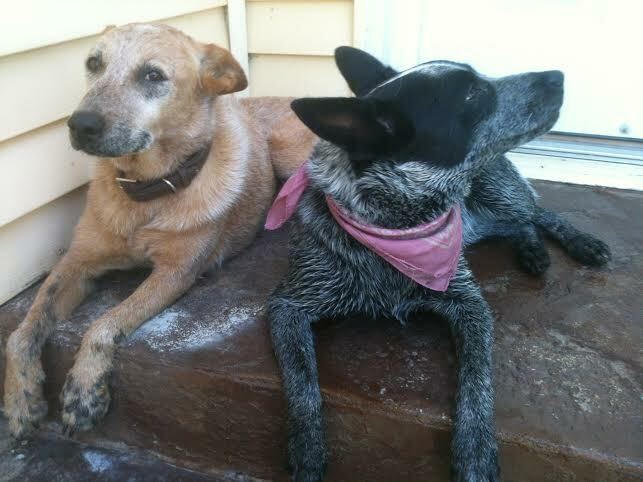 My buddy Lucas had a dog named Reba, a red-heeler, that he had raised since she was a pup. She worked cows, did tricks, and followed him across the country to rodeos. She was a cow dog, and like k9 officers and their dogs, that working relationship only made them closer. She was lost once for a few days…it was a tough few days. Lucas’ wife would tell you that Reba had his heart first, and its true. Ivy would also say that Reba graciously let her into the family. Reba was a great dog. The other they came to the CYRA Finals to preach at cowboy church and Reba was there, laying in the arena, never losing sight of Lucas. She had been having trouble breathing for some time, and that night she was suffering so much that she had to be put down. I hurt so much for Lucas and Ivy when he told me. A good dog wraps itself around your heart like a branch grafted into a tree. So seamless that it is tough to tell where one begins and the other ends. Reba was a great friend to one of my best friends and that is why I hurt for them. Reba, Pumpkin, Buck, Bo, Jesse, Gina, and Hawkey, were the reason we got Penny. They, like so many four-legged-companions in your life, teach us so much we would never learn on our own…and for that we will always be in their debt. 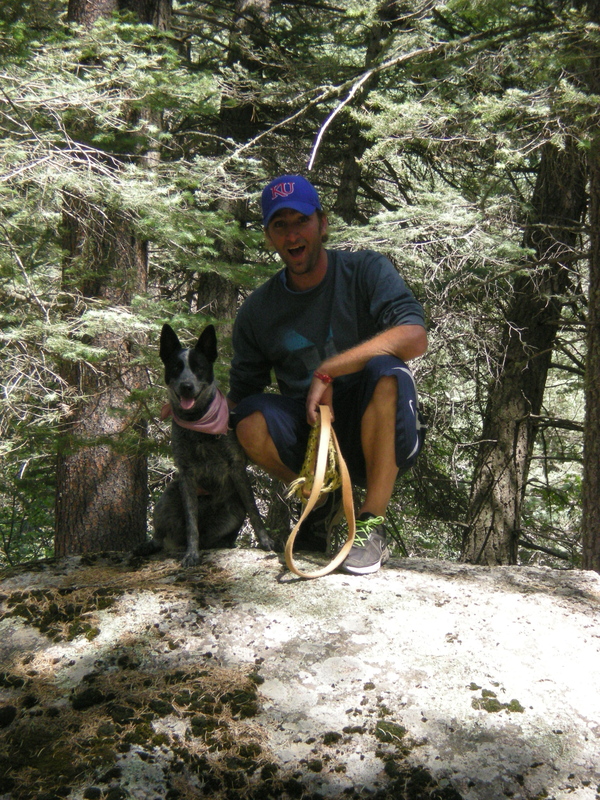 When I was first training Penny, I couldn’t find a leash to use, so I used a 30’ lasso. She mastered the simple commands real quick. Sit, stay, down, roll, were all things that she could do. I had just bought a book about training stock dogs, so I set out to work on some stock training with her. Penny and I set out to work with a few sheep just to see how she would do. When I let her go the first time she freaked. Instead of herding the sheep she took off straight towards the herd and lept over the back of one of them. I began yelling at her from across the pen. She did a great job of pretending to not hear me. Three laps around the pen later she came to a sliding stop at my feet. I attached my lasso to her collar and let her take off again. I commanded “down” and she felt a quick jerk as she neared the herd. I didn’t have too many problems with her during this phase of her training because I was in position to enforce my commands. She had the freedom to act, a 30’ check cord, but accountability in her actions. This is the same relationship we have with our big-nosed God. The Hebrew word for “nose” is an ambiguous word. In the same way that “hand” and “power” of the Lord are inter-changeable, the “face” and “presence” of the Lord can be substituted for one another, the “nose” and “anger” of the Lord are semantically connected. It makes sense really. Have you ever seen someone’s nose and face turn red when they get angry. If not, just come visit me when I’m working on my truck or playing golf and in thirty seconds, you will have a clear picture. The authors of Scripture, when talking about anger, knew this human phenomenon of blood rushing to peoples faces at times of rage so the Hebrew writers used the same word and nuance for nose and anger. The Lord, in his own words, is ‘long of nose”. Presumably, and I’m only speculating here, it seems to be a reference to the time it take’s God’s long nose to turn red. The context of this phrase, “long of nose”, provides some coloring to its significance. Yahweh also “maintains love to thousands and forgives wickedness.” Just because God gets angry, sometimes its even with his people, it doesn’t change the fact that he loves us and forgives us. The next phrase, “et he does not leave the guilty unpunished” shows his justice and his hatred of sin. Our love of something is only proportionate to our hatred of that which opposes that love. A dad’s love for his daughter, is shown in the lengths he will go to defend her. As a buddy of mine says, “he’s got a gun, a shovel, and land….I doubt anyone would find you!”, when a young man arrives to take his daughter out. Yahweh’s slowness to anger is the balancing act between showing love and dishing out wrath. Where as I can let others get away with too much at the expense of those I love, I sometimes am too quick to anger in dealing with others. My “nose” is often too short. The size of God’s nose shows us his passion, his desire, for us. He loves us so much that he doesn’t wipe of off the face of the earth at every mis-step, but he hates sin so much that he acts upon it with vengence for what it has done to us. Sin doesn’t define us nor does it become our identity…sin is something we as those that were created in the image of God, struggle with, get bound too, and enslave ourselves too. God is slow to anger, meaning he does act, but the leash is long. If you were listing God’s attributes, where would you put ‘slow to anger’ on the list? What is one specific example of a lesson that it took you a while to learn from God? Are you better than my Cowdog? We climbed up here ourselves! Job, a successful and happy man, is living his life in the land of Uz (1.1). He lived his life with integrity and devotion to God (1.5). He was rich both monetary (1.3) and familial (1.2). His family, wealth, integrity, and all the things surrounding Job made him the greatest man among the people of the East (1.3). Job’s fame, fortune, but most of all his integrity caught the eye of Satan. Satan comes to God after a long day of chores on earth (1.6) and God confronts him. God says: “You set your heart on Job because…” (1.8) The NIV depicts God putting Job up on a pedestal for Satan to shoot at, but the Hebrew displays God telling Satan why he has it out for Job. Satan has set his heart (hb. Leb), his will, against Job. God understands why Satan has picked him out of the masses as he continues: “There is no one on earth like him: he is blameless and upright, a man who fears God and shuns evil.” (1.8) God knows why Satan has picked him out, because of his integrity, because of his love for God. Satan responds to God by saying: “Does Job fear God for nothing?” Satan replied, “Have you not put a hedge around him and his household and everything he has? You have blessed the work of is ands…but stretch out your hand and he will surely curse you to your face!” (1.9-10) Satan responds by saying God is holding the doggie treats! Penny the Cowdog is a smart animal who picks things up quick. She can do tricks, like sit in a chair, rollover, play dead, high five and various other pointless things. She can work a cow, ride in the truck and Im trying to get her to sense when my blood-sugar is low (that’s a tough one). She is also well trained enough to walk her into Wal-mart with a service vest on (not that I have ever done that). Penny, though a year-and-a-half old, is going through a stage where she needs to see a bag of treats in hand before she acts, kind of a show-me-the-money-upfront mentality. With jerky in hand, she makes lassie look like a dummy, without them, she makes me look like I am speaking in tongues. This is the same relationship that Satan is accusing Job of having with God. Satan is putting on trial the sacrificial relationship between God and Job. Satan says, “Job is doing what you want him to, following your commands, because you are shaking the dog treats in front of him. Put the bag away and he will curse you to your face!” Job’s success, his family, his fame, his fortune, is simply the treats God has given for doing a trick. Satan approaches God and argues “if the bag of treats is dropped, Job will drop God!’ Job is playing the literary role of the Everyman here, so Satan’s attack really involves us. The question: “Is man capable of sacrificial, unrequited, love?” God made man in his image (Gen 1.26-28), Satan making a claim that somehow that image isn’t really a reflection of God. The chips are down on Job to see if man can really reflect God. If you don’t know the rest of the story, Job passes the test. Man is capable of sacrificial love and our creation in the image of God is upheld and proved legitimate. Satan goes back to his chores and Job continues to serve God. So what is God’s relationship to man? Is man really in it for himself? Is God really the cosmic vending machine, we put in service he gives us what we want? No. Is man really just a dog waiting for a treat? No. Satan has it wrong on all accounts, man and God really are capable of sacrificial love, and that is where I distance myself from my dog! Penny, my year old blue heeler pup, makes me answer a lot of questions. I want to answer that question today: “what is she good for?” She isn’t into training. I have zero cowboy training so I figure the blue heeler Penny shouldn’t need much training to do cow work. As Baxter Black put it: “It’s sort of a ‘hike it to me and go out for a pass’ type of working relationship!” (Black, “Sheepmen, Border Collies and Mules”) She isn’t into work. I have been putting up fence, digging holes, and putting in posts. She has dug holes over my entire property, not one of them was where I needed it. She constantly steals my work gloves, runs off with my tools, and has started playing this annoying little game of stepping into wet concrete just to see if I will lose my temper. She’s winning! John R. Erickson, creator of Hank the Cowdog, had this to say about dogs: “Only the Maker of galaxies would have thought to give mankind such a marvelous gift as a dog.” (Story Craft 89) So what is Penny good for? She has the ability, with one look, to make me honest with myself. This idea came to me as I spent 2 hours digging through rock to put in a post. She sat next to me the whole time with a look that communicated the complete pointlessness of my endeavor. It was at that moment that I wondered about how I spent my time. She goes with me to youth group sometimes. She hangs out with me as I prepare lessons, find games, buy snacks, go to games and cross country meets, and a ton of other job requirements. Every night I find myself looking both women in my life in the eye (Tricia and Penny) having to give an account for the day. The shorter one is harder to justify things too. She is a constant reminder that I have things to accomplish and a higher call than survival. She doesn’t know theology or kingdom work, but her look questions me constantly? Have you ever wondered how your dog would view your daily life? I know this: God is constantly asking me for my best, to focus on the eternal, and to be diligent in the things before me. God is asking every night, the same question that Penny asks, what did you do with today? I pray that I have more to say to God then I usually do to my dog.